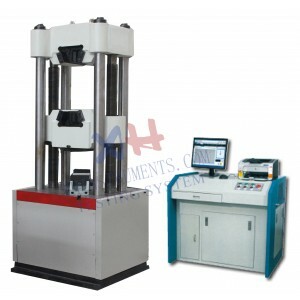 Servo Control Hydraulic universal testing machine- xhinstruments.com! XHL-05 series computer control hydraulic universal testing machine are widely used for tension, compression, bending and shearing test of metal materials and also used for compression and bending test of nonmetal materials, such as cement, concrete and so on. It conform to ISO 7500/1 Class1, ASTM E4, BS 1610 Grade 1, Din 51221 Class1. 1. Control card adopts advanced neural adaptive PID control algorithm, and truly realizes three closed-loop digital control. maximum resolution of 1/300000. There is no subsection of all process, meanwhile it can have 4 subsections or no subsections according to customers’ requirement. 3. Select BB, AD and Xilinx original brand integrated devices and digital design. 4. Built-in large scale CPLD programmable device with high-speed computation capability and real-time processing digital signal. 5. Integrated dual roads precision instrument programmable amplifier, digital zero and automatic smooth shifting. 6. Select high quality imported servo valve block, all control signals photoelectric isolation, 24V DC and safe and reliable. 7. The professional software runs on Windows98/2000/XP operating system, the testing machine can process test result and then output test report and the characteristic curve design. 8. Real-time record and dynamic display test curve, select the point and detail analysis. force, elongation, tensile strength, elasticity modulus, yield strength, non-proportional extension stress, Rp0.2(бp0.2), Rsl(бsl)), Rm(бb), R p0.05(бp0.05) and E, etc, also with analysis process with man intervention, thus improve accuracy. 10. Adopts human-computer interaction to analyze and count performance indicators of materials. It has both automatic and manual modes.